AFTER A LONG SATURDAY... SUNDAY WHICH HAPPENS TO BE WINTER SOLSTICE ARRIVES AND AS SOON AS I WAKE UP... I REALIZE THAT IT'LL 12 HOURS LEFT BEFORE KAHEALANI ARRIVES IN BETHEL, ALASKA!!! IT WAS THE LONGEST SUNDAY EVER... BUT I HAD ALOT TO DO TOO SUCH LAUNDRY AND CLEANING UP THE LIVING ROOM AND PLACE THE PRESENTS AROUND THE LITTLE TREE THAT I BOUGHT JUST FOR KAHEALANI TO SEE AND ENJOY WHILE SHE VISITS. I ALSO PLANNED ON ATTENDING THE "CHRISTMAS PLAY" BEING HELD AT THE "UNITED PENTECOSTAL CHURCH". 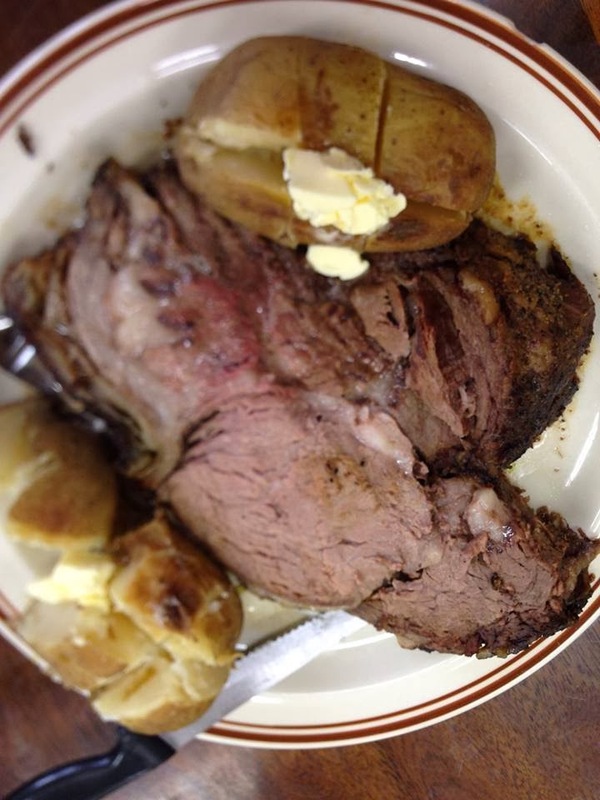 THAT'S RIGHT... PRIME RIB AND SOME BAKED POTATOES!!! IT WAS TOO SALTY FOR ME SINCE I PRETTY MUCH CUT OUT AS MUCH SALT AS POSSIBLE. BUT IT WAS YUMMY!!! RIGHT AFTER THAT MY LAUNDRY WAS DONE AND BACK HOME I WENT AND GOT READY TO ATTEND THE CHRISTMAS PLAY. I ENJOYED EVERY MOMENT OF THIS VERY "CUTE" CHRISTMAS PLAY AND SEEING THE CHILDREN AND HEARING THE SONGS BEING SANG CAN... I CAN NEVER GET ENOUGH OF THE HOLIDAYS!!! WHILE I'M ENJOYING THE CHRISTMAS PLAY... IT WAS ONLY A MATTER OF SEVERAL HOURS BEFORE KAHEALANI ARRIVES!!! MY HEART IS RACING AND MY ADRENALINE IS PUMPING... I WAS EXCITED!!! THEN I RECEIVED A TEXT MESSAGE FROM ALASKA AIRLINES... "FLIGHT CANCELLED"... PLEASE CONTACT OUR SERVICE REPS!!! THE FIRST THING THAT COMES TO MY HEAD WAS... "NOOOOOOOOO!!!" I HEAD OVER TO THE ALASKA AIRLINES TERMINALS AND WAS TOLD THE LANDING STRIP LIGHTS WERE NO IN SERVICE AND IT WAS ALREADY DARK. I WAS ALREADY SAD TO FIND OUT THAT I WAS NOT GOING TO SEE KAHEALANI UNTIL ONE MORE DAY... UGHHH!!! "DAD... THIS PLACE IS "AWWWESOME" AND THEY GOT A FLAT SCREEN TV WITH LOTS OF MOVIES TO CHOOSE FROM, A HUGE SOFA THAT I CAN LAY DOWN AND CRASH OUT ON, ALL KINDS OF FOODS AND DRINKS AND IF I WANT TO EAT AT MC DONALD'S... THEY SAID I COULD!!!" AFTER HEARING THAT, I WAS PRETTY SPEECHLESS BUT HAPPY TO HEAR HER VOICE AND THAT SHE SOUNDED HAPPY. AND BEFORE YOU KNOW IT... "DAD... I'M GONNA GET OFF THE PHONE BECAUSE I'M WATCHING A MOVIE RIGHT NOW... BYE!!!" SO ANOTHER 12 HOURS OR SO THAT I HAVE TO WAIT... AND YES... I WAS SAD. AT LEAST KAHEALANI WAS IN GOOD SPIRIT AND NOT UPSET FOR BEING AWAY FROM FAMILY IN THAT PARTICULAR SITUATION. SO MONDAY MORNING COMES AND I RECEIVE A TEXT THAT MY KAHEALANI HAS LEFT ANCHORAGE AND WILL BE LANDING IN BETHEL WITHIN THE HOUR. I GOT OUT OF BED AND WARMED UP THE CAR AND THEN HEADED OVER TO THE AIRPORT!!! SHE FINALLY ARRIVED AND I AM SO HAPPY AND BLESSED TO HAVE HER FOR THE HOLIDAYS!!! THANK YOU GOD FOR BRINGER HER SAFELY TO ME. AND THANKS TO ALL OF YOU FOR YOUR PRAYERS TOO!! !